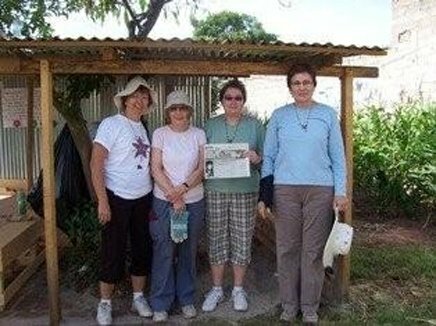 "The Quill" went to Honduras in August 2012 with Sharon Hicks. Sharon went on a mission trip with the United Methodist Church Illinois Great River Conference group. Their mission was to help with the beginning process of building a new church in - a suburb of the - capital city of Tegucigalpa and leading a Bible school with some of the local children. It was a good trip with lots of hard work. Sharon is pictured with Ann, Madonna and Donna. When you go on a trip, take "The Quill" along and have your picture taken with it and then send it to us. Let's see where all "The Quill" can travel.